And check out OUR NEWLY LISTED ITEMS. This is an original art page for What If #1, published by Marvel Comics in February of 1977. 30 from the classic issue featuring the very first Marvel What If, What If Spider-Man Joined The Fantastic Four? 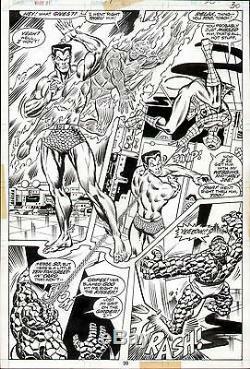 It is a classic example from a key first issue, with splashy images of Spidey, the Sub-Mariner, the Thing, and the Human Torch. The page not only features all these characters, but has an innovative layout where the panels blend together, giving the page a spectacular visual appeal that has the appearance of a splash page. It goes without saying that 1970's Spiderman pages are highly sought-after, and the same is true for the Fantastic Four, and vintage historic key 1st issues of the Bronze Age even more so. To get a piece from the 70's of this quality is difficult, as they rarely appear on the open market, and with What If having a cult following, once pieces go into collections they do not come out again. This is a n exceptional and unbelievably rare piece of 1970's artwork, that would look amazing framed and prominently displayed, and would be a true key piece in any collection. Check out our other auctions for more great items. Check it out, you'll be glad you did! The item "1977 WHAT IF #1 SPIDERMAN FANTASTIC FOUR ORIGINAL ART PAGE MARVEL COMICS FF" is in sale since Monday, March 31, 2014. This item is in the category "Collectibles\Comics\Original Comic Art\Splash Pages". The seller is "satchj3" and is located in Brooklyn, New York. This item can be shipped to United States.